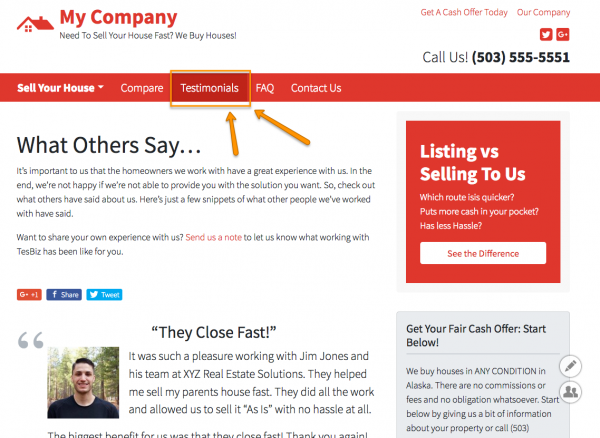 The purpose of this tutorial is to teach you how to add a testimonial to your site. Testimonials can dramatically enhance your credibility and improve your lead flow. Let’s get your first one in! For more information and examples of this, drop down to our Learn More section. Step 1: Go To Your Site Content Area. Step 2: Click on the “Testimonials” tab. Step 4: Enter your testimonial. Step 5: Add a photo if you’d like. 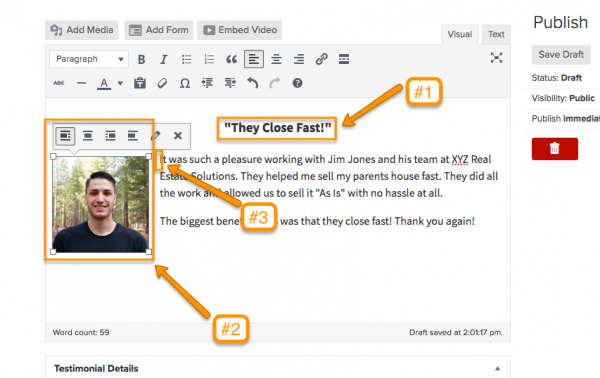 Click here for a more detailed explanation on adding an image to your testimonial. Step 6: Add the testimonial author. Step 8: (Optional) Tweak your testimonial for biggest impact! Pick out a key phrase to highlight. Align the photo with the content. This example is aligned left. This testimonial has the photo placed at the beginning of the testimonial. You can drag and adjust the photo to fit how you want it. What Is In A Good Testimonial? Ideally, testimonials should show the website visitor why you are a good, honest, ethical, and effective person to work with. You don’t have to have done 100 deals to be able to be an honest and trustworthy person who is able to help a seller sell their house fast. Right? So get testimonials on your website that give people a good glimpse of who you are as a person, your ethics, honesty, knowledge, etc. If you have done deals, work to get testimonials from every client you work with (buyers, sellers, tenants, lenders, etc.). Ask them about their experience, what they loved, what you can improve on, and how you helped them (as specific as possible). Then you can use those in your marketing as you go. If you haven’t done any deals yet and think you can’t add any good testimonials to your websites, I always advise clients to first get character-based testimonials. We all know someone who can “vouch” for us such as a current or previous employer, Pastor, business associates, insurance person, banker, ect. These may have nothing to do with your experience in real estate at all… but 100% on the type of person you are and your integrity, honesty, and ethics. As you see, the testimonials don’t have to be just about closing deals… they can also focus on your character to help boost the credibility on your website. Then, as you start to close deals… gather testimonials from your sellers, buyers, lenders, and tenants at the closing table about their experiences and start adding those to your website as you go! 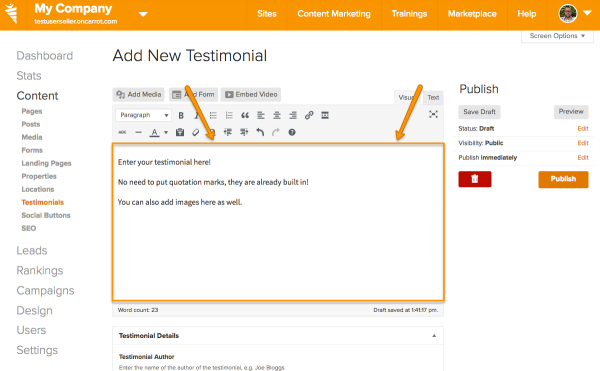 Click here if you want to learn how to add these testimonials directly into the content of your pages or posts. Where do these testimonials appear? 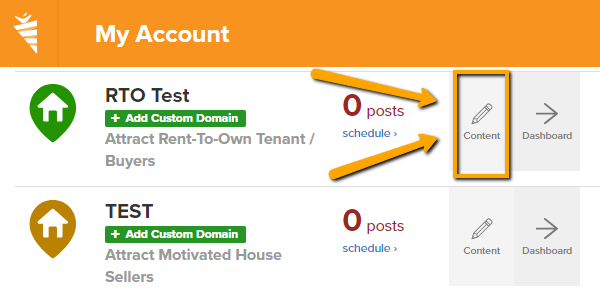 By default, the testimonials will appear in two places. 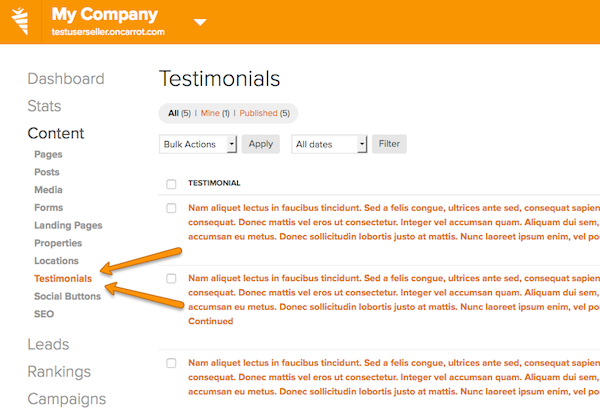 1st In the testimonials widget on the sidebar of your site pages. 2nd On the Testimonials page of your site.